When Megan McArdle, the iconoclastic Bloomberg economics and business blogger and columnist, was growing up, she got into hot water with a teacher at New York’s prestigious Riverdale Country School. Instead of rushing to rescue their child, McArdle’s parents told her she had to learn to deal with authority figures, fair ones and unfair ones. She could sink or learn to swim. “It’s impossible to imagine a parent in the same situation letting that happen now,” said McArdle. “The stakes are too high.” Failure prevention may require tutors who actually do the work or college admission consultants who write the essays. Aside from the morality of such practices, children brought up this way become terrified of failing. “People who don’t learn to fail become very self-protective and are afraid to fail. They feel that, if they fail, it is a referendum on them,” said McArdle. However, “failure is what makes success possible. It’s how we learn what doesn’t work–and therefore how we learn what does,” she writes. 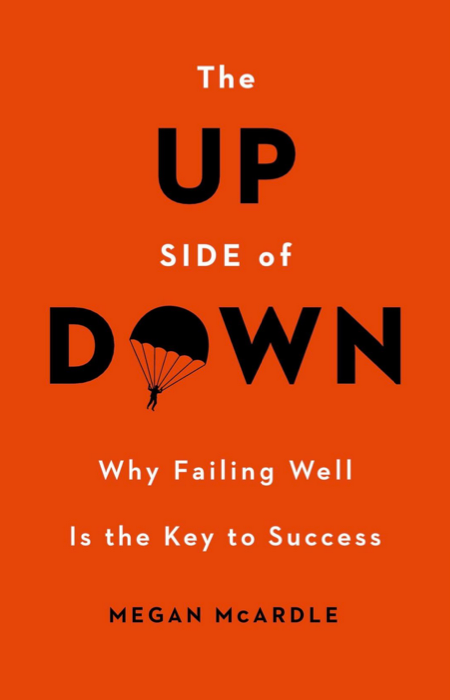 The value of failure—something with which Americans are increasingly uncomfortable—is the theme of McArdle’s new book, The Up Side of Down, Why Failing Well Is the Key to Success. She deals with the private and political spheres. McArdle spoke with IWF shortly before the book came out on February 11. Despite the accolades, McArdle describes herself as a “Mozart of misfortune.” It was a series of misfortunes, she insists, that led her to where she is now. A New York native, McArdle graduated from the University of Pennsylvania and then went on to get an MBA from the University of Chicago’s prestigious business school. Upon graduation, she received an offer for a lucrative job with a technology firm, but the offer was rescinded after the September 11 terrorist attacks sent the economy into a nosedive. By the spring of 2002, McArdle was “getting pretty desperate.” When a date who worked in private equity took her to see “Avenue Q,” a Broadway musical about puppets who were failing in life—so much so that they lived on Avenue Q—McArdle was convinced that he had taken her as a wake-up call. McArdle had mentioned to somebody she knew at the Economist magazine that she’d love to be considered if anything came up there. But it had been nearly two months since she had interviewed for the job. Then the phone rang and it was Anthony Gottlieb, then-executive editor of the Economist. “He said, ‘I’ve called to offer you a job,’ and I said ‘I’ll take it.’” She didn’t even think to ask what he was paying before jumping at the chance. “Aside from my wedding day,” McArdle said, “it is the only time in my life I have ever cried from happiness.” The salary was $40,000—considerably less than what she would have been earning if the tech firm job hadn’t fallen through after September 11. McArdle joined The Economist in 2003, where she remained until 2007, when she became a blogger for The Atlantic. She subsequently became The Atlantic’s business and economics editor. After a year at Newsweek and The Daily Beast—at the time fabled editor Tina Brown’s shop—McArdle was hired by Bloomberg. She lives in Washington, D.C., with her husband Peter Suderman, a senior editor at Reason magazine. Failure should hurt, McArdle argues, because “pain is how we learn.” Unconditional bailouts of failed enterprises, for example, reduce the pain and so no lesson is learned. Similarly, European unemployment benefits that make looking for a job less urgent lead to wasted lives. But the pain should not be such that it permanently sidelines somebody who has failed. McArdle praised U.S. bankruptcy laws, which, despite being too lenient for the taste of many conservatives, aren’t so draconian that the bankrupt person can’t recover. “One of the funny things about the American bankruptcy system that almost nobody knows is that we have one of the most generous systems in the world,” she said. Because the stigma remains, McArdle said, many people who could declare bankruptcy don’t, but those who do have a second chance. McArdle has written extensively on ObamaCare. She was asked if she thinks that ObamaCare will be replaced by a single-payer system, as many insist will be the upshot of the system’s failures. “I do not think we are doomed to single-payer,” she replied. “The reason we didn’t get single-payer in the first place is that too many people have health insurance that they like and the administration wasn’t going to touch that. Hillary Clinton tried to touch in 1993 and that was a disaster that no one is going to try again. [The administration and other supporters of single-payer] don’t have the political capital [to move to] a single-payer system after the disaster that this rollout has been. While McArdle regards the health care reform proposals being put forward by Republican senators Tom Coburn (Oklahoma), Orrin Hatch (Utah), and Richard Burr (North Carolina) as “a big improvement” over ObamaCare, she prefers what she dubs the Megan McArdle Plan: people are responsible for all their medical expenses up to 15 or perhaps 20 percent of their adjusted grown income. After that, the government pays 100 percent. “It is basically a very high deductible, catastrophic plan that is progressive,” she said. It would be impossible for IWF to talk to McArdle without broaching another subject dear to her heart: cooking. She is a foodie and avid cook, whose recipes are often tweeted by husband Peter Suderman. She once described “Avocado Wasabi Ice Cream,” as “about the easiest thing you ever made.” And what mouth does not water over McArdle’s own macaroni and cheese recipe—you’ll definitely need the catastrophic health plan after you’ve digested this delicious, cheesy dish? McArdle is a former vegan who had to give up soy because of a thyroid condition, but she only eats humanely raised and killed animals. “I take seriously the way animals are treated,” she said. “Am I opposed to animal testing for curing human diseases? No. But when I look at the way factories treat animals, it is quite cruel. They can be kept in dirty places their whole lives, and then they die. And you can ask—was that a live worth having? It’s not like the family farm of a hundred years ago. It is hard to put a label on McArdle, who writes with that rare combination of smarts, common sense, and humor. She may have written a book on failure, but one can see that she is now solidly on a road of even more success.